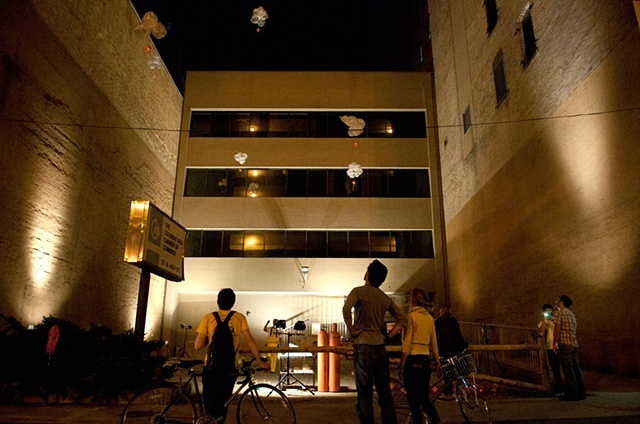 Pig Bladder-clouds were hybrids constructed out of natural materials such as dried pig bladders, tree branches, and moss and the industrial materials such as Helium-filled plastic trash bags and electronic LEDs (Light-emitting diodes), which created synchronous movements with natural air currents and visual performances. These were installed in exterior public spaces such as streets and coupled with performance such as a butcher performance, a street parade, and a flash mob with viewers’ participation. The Pig Bladder-clouds were installed and presented as a performance in downtown Columbus, Ohio, in *Art Squatters8, curated by Professor Malcolm Cochran at the Ohio State University, during September 5th, September 19th, and October 3rd. The Pig Bladder-clouds project was influenced by scientific news, in which an old man in Ohio re-grew his wounded fingertip. His finger, sliced in the propeller of a model plane, was repaired using special medicine extracted from the powder of a pig bladder. Pig Bladders-clouds project points out the characteristics of the human-swine hybrid in the saga and references cross-species hybrids created by Genetic Engineering. The ideal materials in the creation of the artificial hybrids celebrate the possibilities offered by "xenotransplantation", reusing living tissues, cells, or organs to regenerate damaged organs of a human being (non-human). The butcher costume within the performance suggests that the work of butchers could yield more than just food, and that butchering animals may aid medical research and thus provide more than just nourishment. The performance and parading down Gay Street in downtown Columbus, with participating viewers who paraded the floating pig bladder sculptures is related to Allan Kaprow’s notion of the “happening”. The parade visited other artist’s performances in other galleries, such as performance artist Aaron Hibbs’ hula-hoop record attempt in Skylab Gallery. The pig bladder-sculptures and other random participants in the parade occupied some parts of his performance space, much like a Flash Mob.